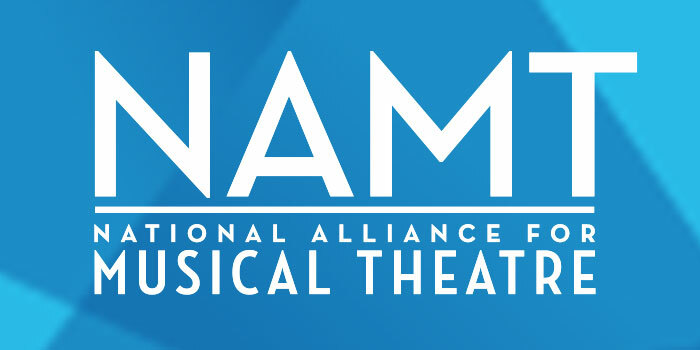 NAMT’s surveys provide you with concrete information about musical theatre industry trends and practices that can save you money when you’re hiring, negotiating, and planning your season. What is NAMT by the Numbers? Every spring, in preparation for the start of our new membership year (May 1 – April 30), we ask members to update their organizational information with us. A summary of this information appears on our website and in various NAMT documents, and a more detailed version is published as the NAMT by the Numbers survey. All NAMT members are encouraged to participate, and may update their info at any time here. 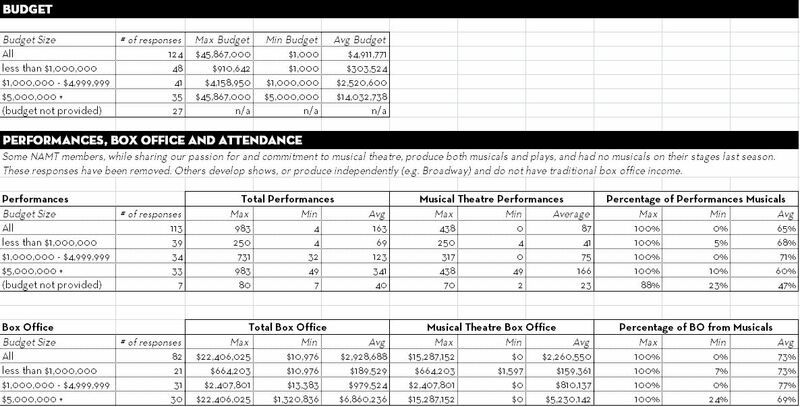 Some members are required to provide their musical theatre box office information in order to calculate their annual dues. New members’ data is reported on their membership applications. Yes. The data is aggregated and broken up by budget size. No theatres are identified. My theatre is unique. Won’t my answers give me away? In some cases, a wide range is exactly what we’re after, so it’s possible that people will guess that you’re the only NAMT member with 5,000 full-time employees. But every question is separate, so there’s no way to connect one piece of data to another that you may not want to broadcast. In rare instances, we may eliminate a response if it skews the data wildly. Each line in the results shows how many responses were used to calculate that section. The complete NAMT by the Numbers results are published annually on our website. How often is the survey conducted? We ask existing members for their updated information each spring, and publish the full survey every summer. The shorter summary results are updated periodically on our website, in the Festival of New Musicals program and elsewhere. 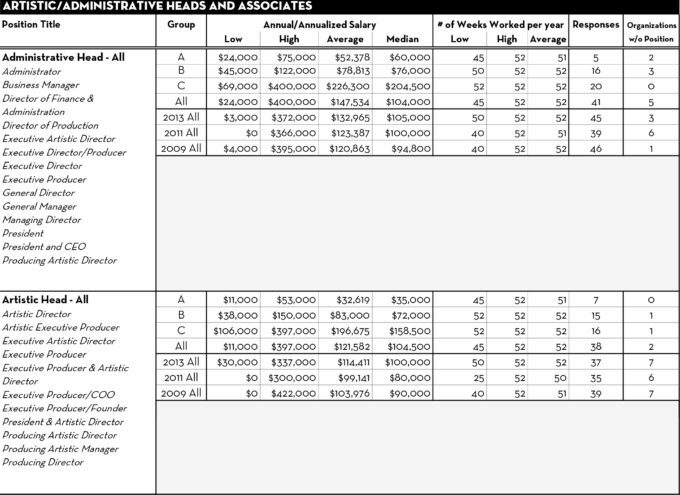 What is the Salary & Benefits Survey? The Salary & Benefits Survey provides an extensive overview of salaries paid and benefits provided at NAMT member organizations over a two year period. This survey is open to organizational NAMT members in the United States. Can I participate if my company is outside of the United States? Unfortunately, because other countries’ models for benefits like health insurance and paid leave are so different from those in the U.S. (and in turn can effect compensation), inclusion of our non-U.S. members skews the data wildly. If you believe your company’s structure is close enough for your data to be included, please email adam@namt.org to ask about an exception. 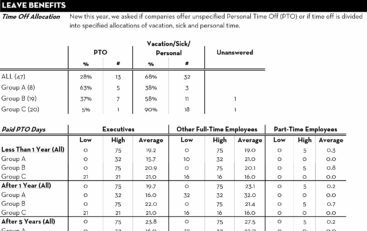 The results can help you negotiate with future hires, see how your practices compare with other theatres, provide data to your board for budgeting, and generally illustrate industry practices and trends in salaries and benefits. Yes. The data is aggregated and grouped by budget size. No individual theatre is identified. My theatre is unique. Won’t my information give me away? In some cases, a wide range is exactly what we’re after, so it’s possible that people will guess that you’re the only NAMT member with 5,000 full-time employees. But that’s a separate question from your salary, so no one will be able to connect the two. In rare instances, we may eliminate a response if it skews the data or might identify a theatre. Each line in the results shows how many responses were used to calculate that section. Theatres can be structured fairly differently; how do you make everything match? We ask what leadership model your company uses (a single artistic head reporting to the board, such as a Producing Artistic Director; a single management head reporting to the board, such as an Executive Director; or shared leadership, such as between an Artistic Director and a Managing Director) and report both on the entire range of these top leaders and separated by the different models. 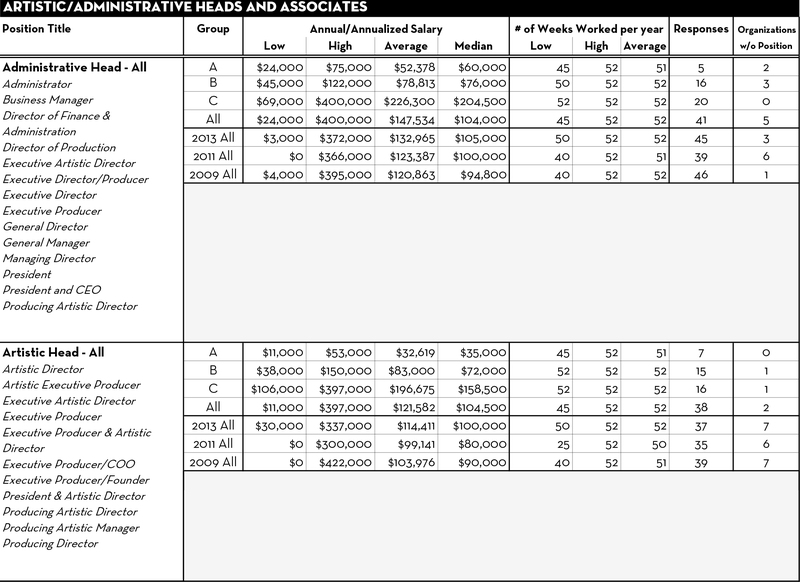 For most administrative positions, we list job titles so that readers can see what sorts of positions the data applies to (for example, Executive Director, Producer and Managing Artistic Director may all be structural equivalents). We also differentiate between a question where the position doesn’t exist at an organization, and where the question was skipped. All salary data is annualized so that it may be compared easily, and we collect the typical number of weeks worked per year for administrative staff, and hourly wages and hours worked for crew and front-of-house staff. Probably 1-2 hours, plus more to gather the information if you don’t have it readily available. You may stop the survey and come back to it later if necessary. What is the Success Survey? The survey lists musicals produced by NAMT members in the last two years, with information about royalty percentages and guarantees paid, expenses and income, along with metrics for the theatre’s perceived risk in producing the show, the amount of marketing on it, and its success relative to your expectations. Any organizational NAMT member in good standing may participate in the Success Survey. The results will help you negotiate with licensing houses by showing what other theatres paid for royalties, as well as how titles performed for other theatres. You’ll also get to see trends in the industry – what shows are being produced a lot and how are they doing? This may help you plan your next season, as you can see what is and isn’t working elsewhere. See the attached excerpt of the results. Yes. We do not identify the theatres in the results, and they are grouped by budget size. It varies depending on how many shows you have to enter. If your theatre only does one musical a year, it may take 5 minutes. If you only do musicals, it might take an hour. You’ll also need to gather some budget, box office and royalty information. We did a show no one else has done. Won’t people know that’s my theatre? It’s true that some survey responses may give you away. If you do show that’s unique to your company (“A Very Merry MUNY Christmas!” – we made that up), or premiered a new work that hasn’t been done anywhere else yet, readers may know who you are. Feel free to skip over those shows when providing your data, or request that we list the show without a title (e.g. “World Premiere”). Though in the latter case, many respondents opt to share anyway in order to help further the life of the show! Most fields are not required, so if there’s some other unique feature that you worry may identify you (your theatre only has 5 seats, for example), you may leave that blank. “Perceived risk” and “success relative to expectations” sound subjective. They are! That’s exactly why we ask them, to give readers of the survey a better idea of your market and your perceptions while allowing you to stay anonymous. A title that’s edgy or risky for one theatre and its audience may be par for the course for another for a variety of reasons. Maybe theatre is doing a newer musical for the first time and that’s all the other one does. Maybe a smaller theatre is taking a chance with a big-budget show. Perhaps a show under-performed for a theatre but was considered a bigger risk for them than it would be for you; you can take this into account. The success question, too, is meant to be relative to expectations. Some theatres take risks happily for a project they believe in, knowing it may not sell as well but that those audiences who come will love it. So we ask about numbers as well as perception. Lastly, we ask if you marketed the show as usual, or gave it an extra boost to account for the perceived risk.